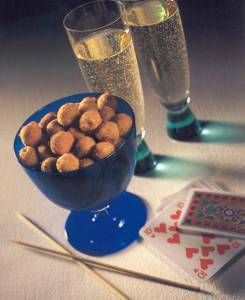 Venetian bar snacks called cicchetti are similar to tapas. Tapas? In Venice? But consider that Spain was a destination of Venice’s far-flung merchants. Furthermore, given the theory that the custom of tapas might have been of Muslim origin and that the Arabs were also trading partners of Venice, it is hardly surprising that such snacks are now commonplace in the city. These savories might well include the sage potato chips served at Remi, but traditionally they might amount to simpler fare. Fried green olives are among the more intriguing and irresistible examples. It should be noted that in the region around Venice the olives served are invariably green. They come from the Lago di Garda. “Black olives are from the south of Italy,” explains Francesco. 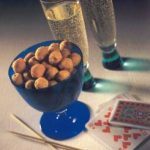 In addition to this and the following recipe, some other classic cicchetti include hard-cooked eggs sliced in half and topped with an anchovy, a plate of small grilled sardines, pieces of grilled sausage, and nuggets of cheese. Place the olives in a bowl, cover with cold water, and allow them to soak at least 15 minutes, to remove some of the salt. Rinse the olives and dry them well. Toss the olives lightly in the flour, then dip each in beaten egg. Roll them in the breadcrumbs to coat, place on a plate, and refrigerate one hour. Heat enough oil for deep-frying in a skillet. Place the olives in the oil and fry them, rolling them around to brown them evenly, until they are golden. Drain on absorbent paper and serve while still warm. They can be held for a few hours, then reheated in a 250°F (120°C) oven.